So I’m one of many looking for the best possible lighting from our old cars. It seems to be HID’s are the most sought after lighting. But in order to use HID’s you need a composite style headlamp. There are many options available for composite headlamps for both 7” and 5 ¾” headlamps. You can just get any composite headlamp and stab a HID bulb in it but that will blind everyone in front of you and not to mention put you at risk of a ticket. The best possible option for your HID set up is a projector headlamp. A projector is a way of focusing all the light down to where it is most important. For example take a magnifying glass and let the sun shine through it, what does it do? It concentrates all of the light down to one spot giving a more intense beam. It also “cuts” off the light giving you a straight line of light. The purpose of that is to keep the light where it should be and keep it out of oncoming traffic. You don’t have to put an HID in a projector headlamp. The projector will work with any form of light bulb. If you have 7” headlamps there are many projector headlamp styles out there for you relatively cheap. However if you are like me and have the smaller 5 ¾” headlamps then options are few and far between and can be very expensive. Many people have been using the infamous BMW headlights. They are found on late 80s - early 90s and are relatively cheap and at your local junk yards. I picked up all 4 headlamps, 2 highs and 2 lows for under $50. 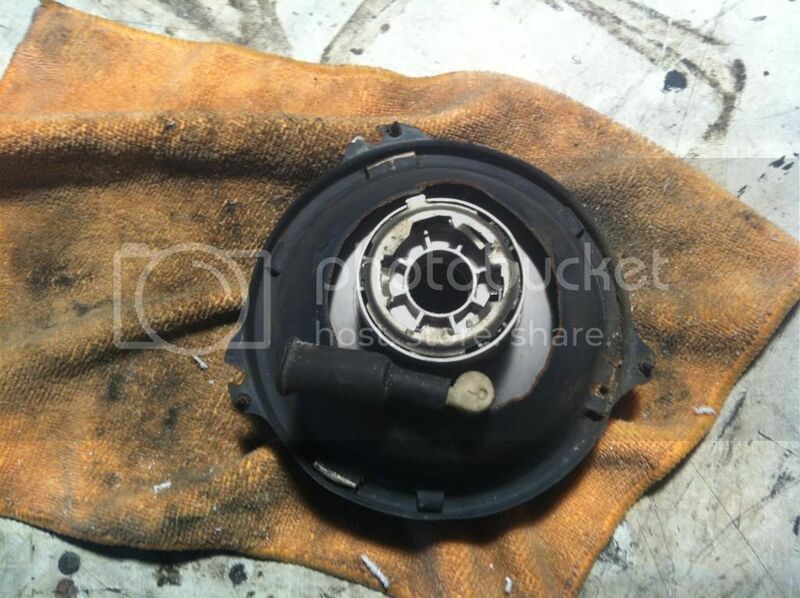 They are the same 5 ¾” round but they will not just drop in they will take many modification to fit them. I am here to share with you just how I fit them in my ’70 El Camino. Now, I’m sure there are other ways to fit these headlamps this is simply how I fit them or my own personal vehicle. Before I start I want to share some of what I have learned about HID’s. I am still learning quite a lot about them, so feel free to comment about this and/or correct me on anything. HID stands for High Intensity Discharge, they require little power yet have a massive output. There are many types of HID’s out there to choose from and they can be very cheap or very expensive. HID’s are like most things nowadays you buy cheap you get cheap quality. I’m not going to name brands or where they can be bought. Many of the cheaper kits are very poor quality and will not last. The reason they are cheap is due to the ballast. The HID bulb is designed for an AC current and not DC like the standard bulbs. The cheap kits use analog DC ballast which can cause flickering and shorten bulb life. The AC ballasts are available in both analog and digital, more commonly digital. AC ballasts give a consistent burn no flickering vibration resistant and far longer bulb life, up to3x longer! Then there are the K ratings. Most people think that the higher the K rating the brighter the light. This couldn’t be further from the truth. In fact the more colorful the light the less lighting there will be. Also if you are driving on the street any color other then white is a potential ticket. Depending on the wattage of the ballast, 35w you want 5000k, 55w you can do either 5000k or 6000k for a white light. Then there is all the confusion about the bulb wattage. In fact the bulb doesn’t have an actual wattage rating. The ballast is what decides the wattage. Yes the bulbs can only handle so much wattage but in fact most bulbs can withstand 60w. The bulb doesn’t care if it has 35w or 55w ballast, but remember like anything the higher the wattage the shorter the life. The 55w is far brighter then the 35w and since it burns so much brighter the K ratings change. So for example if you want a blue tint with 35w you buy 6000k and for the 55w you would buy 8000k. The 35w kits give a large amount of light, but if you want to harness the power of the sun go for the 55w kits! 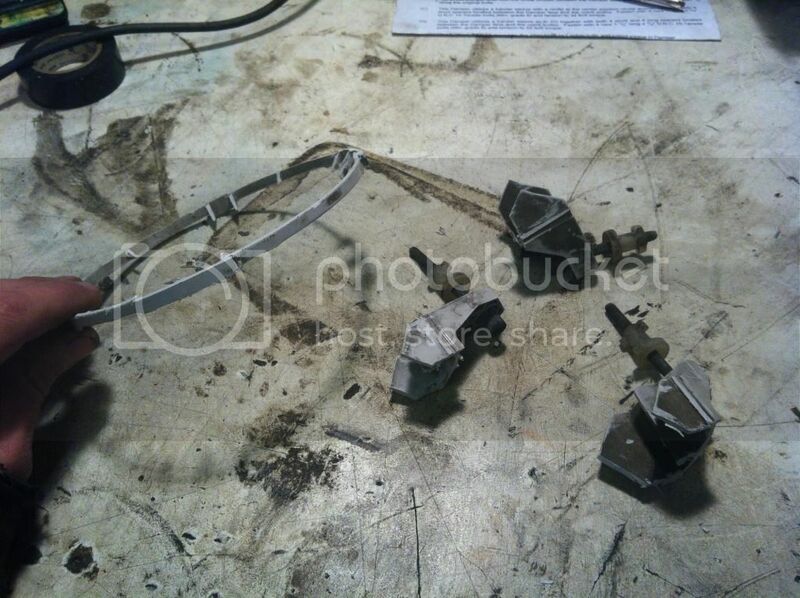 Now when you pull the headlamps from the BMW you will look at them and say to yourself “How in the h*ll are these going to work on my car?” Well here is the way I personally did it step by step with pictures. From here you have to do a lot of trimming. 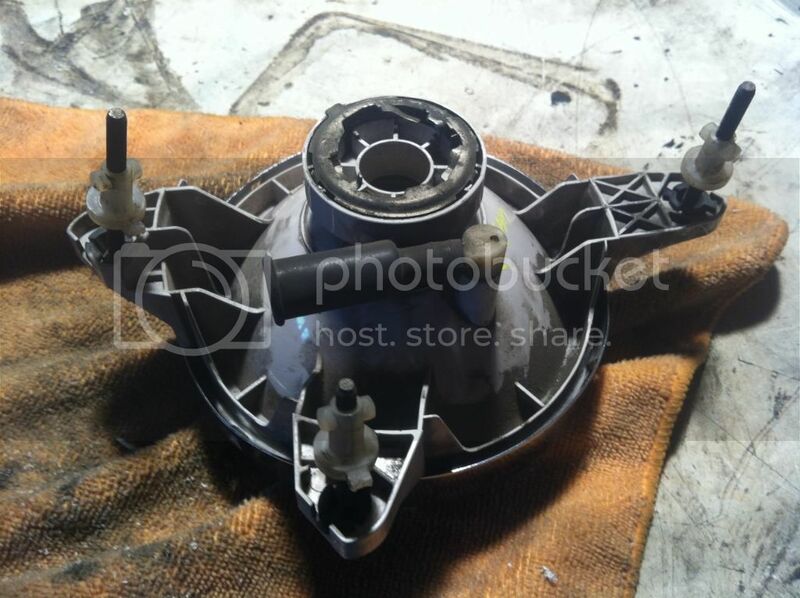 All 3 mounting points have to come off as well as a small lip all the way around the housing. I used a dermal with a small wood cutting bit. It cuts through the plastic fast and easy without melting it as it cuts it. There is no need to smooth them out I left it just like this. 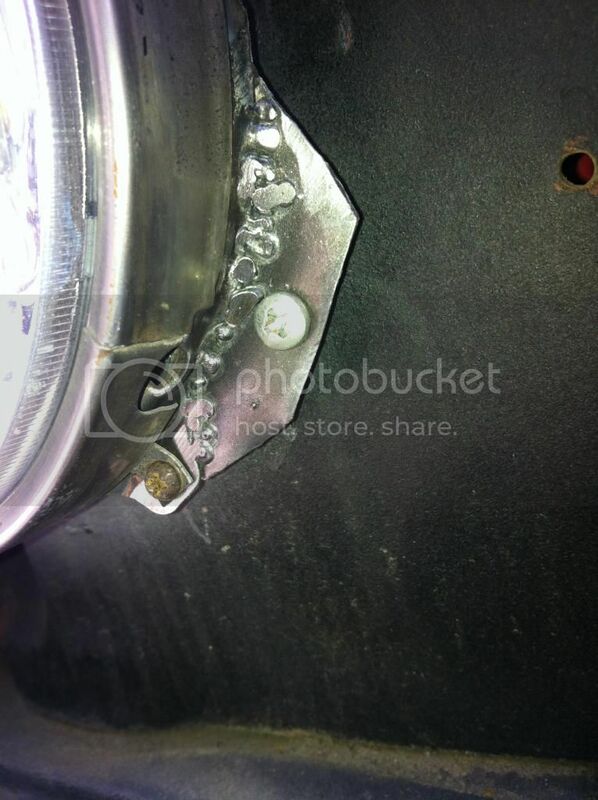 Next you need to create a corner so that the headlamp sits flat on the bucket such as this.. This is just what you have to cut off. As for the headlamp itself you are done with making modifications. Now you need to modify the bucket. 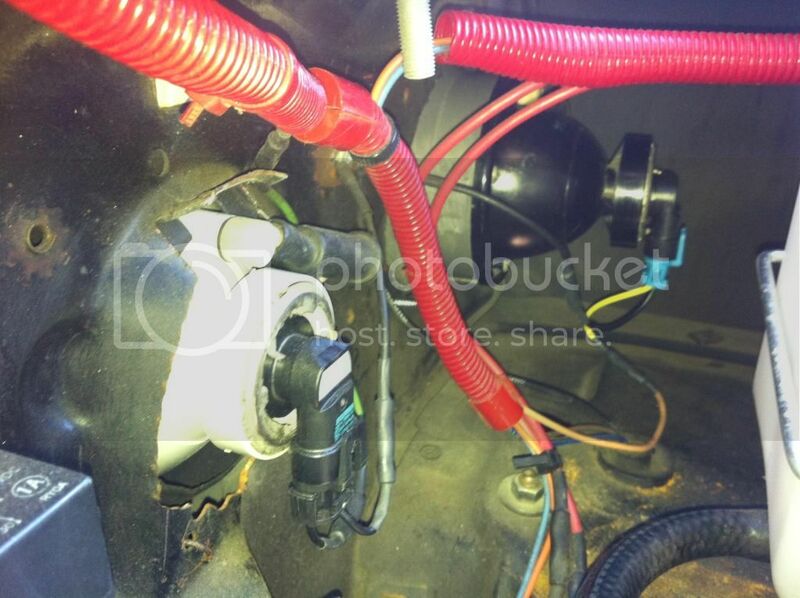 The headlamp is going to need room to pass through the back of the bucket as well as the radiator support. 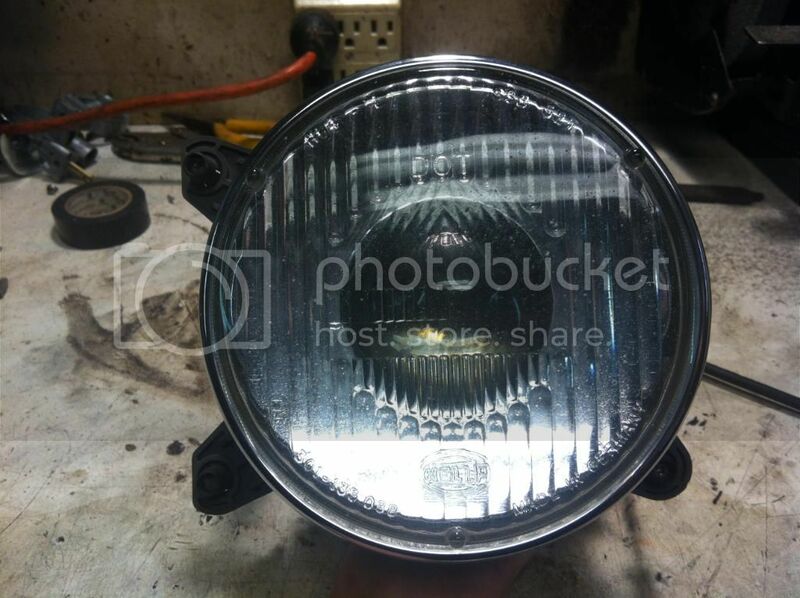 Now I had previously cut out my buckets for other headlights a few years ago. The hole you will need to cut out isn’t quite as large as the one in the picture. You will be able to easily tell once you try and fit the headlamps just how much you need to cut out. 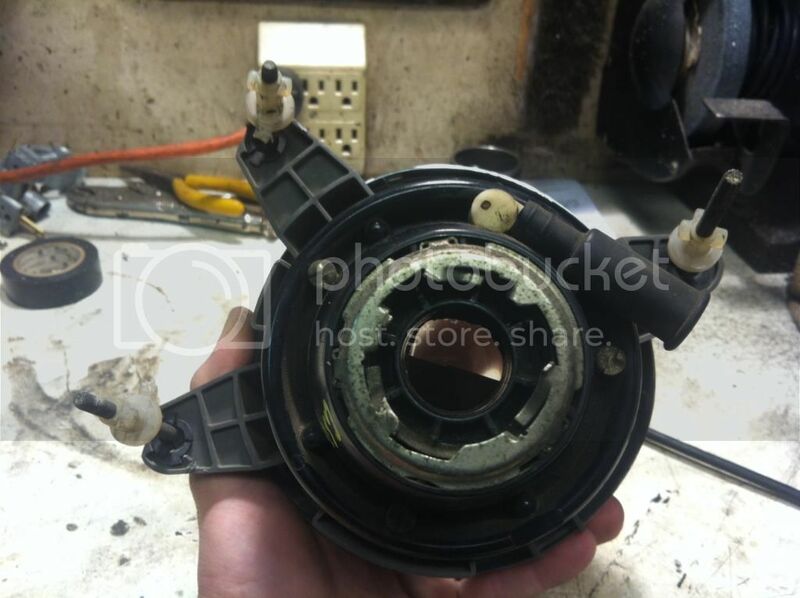 Make that same cut in the radiator support only slightly larger so that you have the ability to adjust the headlamp and not hit anywhere preventing your adjustment. Now since there is no way to locate the top of the headlamp in the bucket you need to line up the top of the bucket to the top of the headlamp. 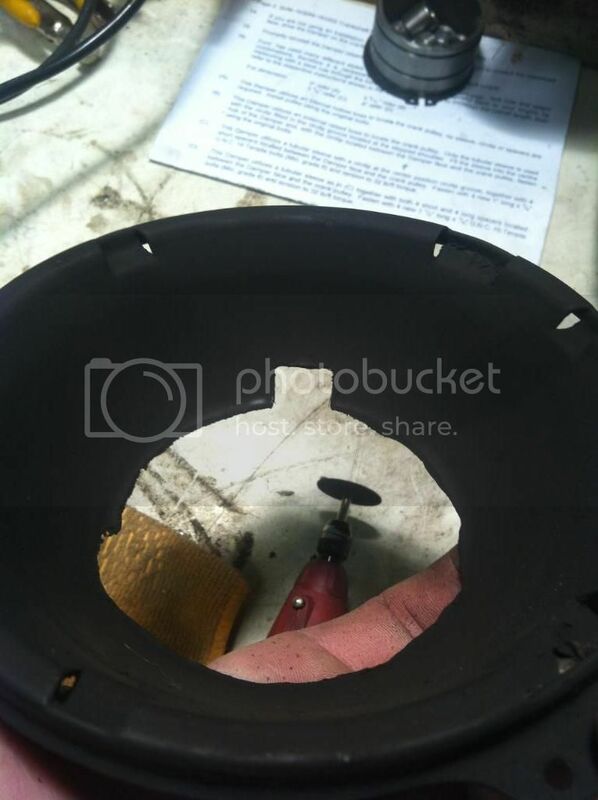 Now cut out a little notch so that the breather tube will clear the bucket and the radiator support. DON’T FORGET TO LINE UP TOP OF BUCKET TO TOP OF HEADLAMP. The breather is at top dead center of the headlamp. 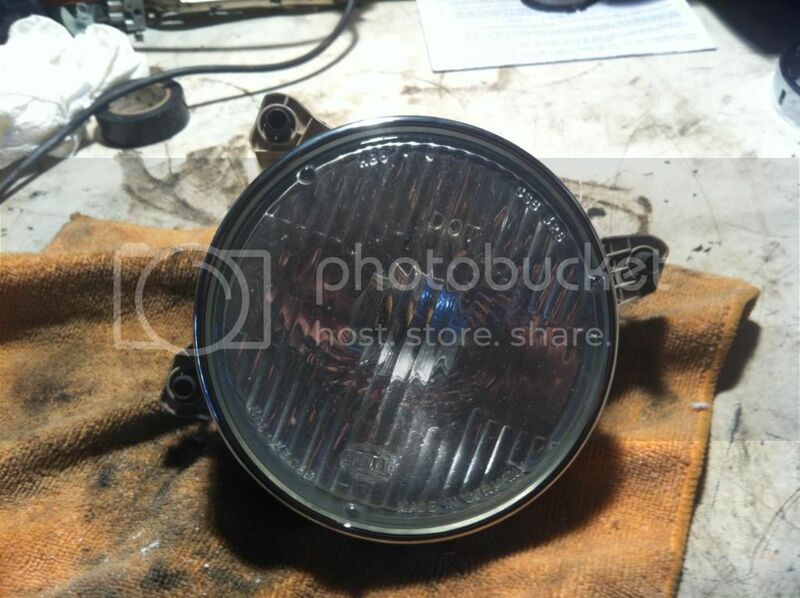 Now mount the headlamp in the bucket and using your old rings that held the sealed beam light in the bucket. 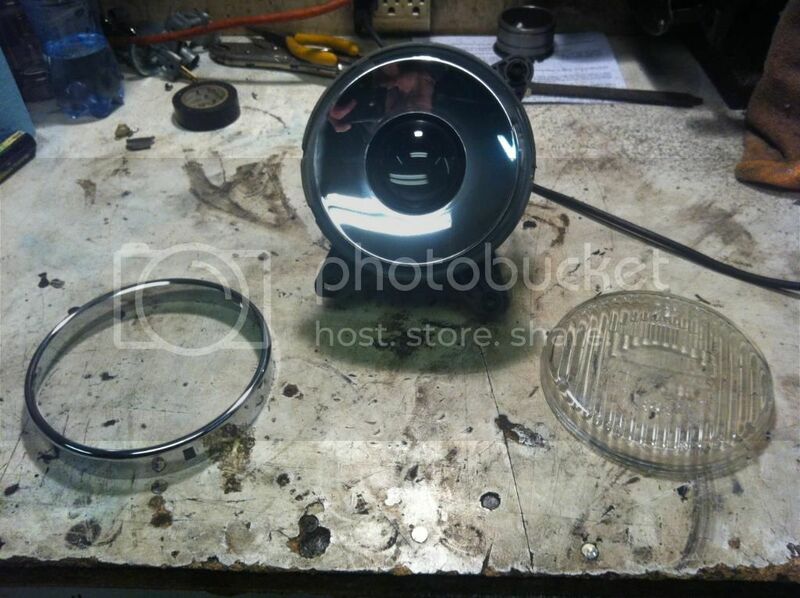 Your finished headlamp and bucket should look just like this. As far as the high beams go you are done just install and adjust them. Now comes the hard part… the low beams. Since the headlamp is so large making them fit was quite difficult for me. I’m sure there are other ways to make the lows work but again this is simply how I did them. Here is what you have to work with. 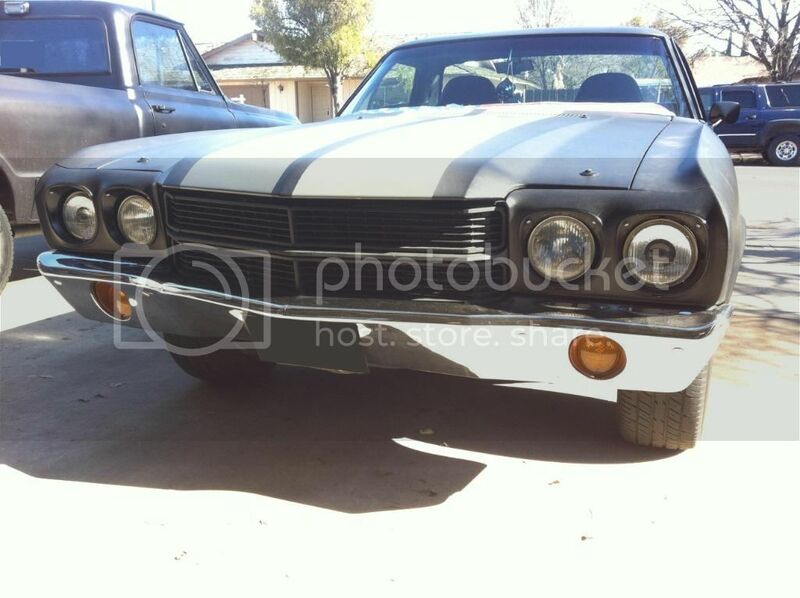 70 El Camino 383 stroker, Eddy thunder 800, RPM air gap, IK 200s, Chris S. roller cam, MSD 6al2, MSD pro billet dist, coan 3000stall, built th350, 12 bolt 4.10s locker. Okay here we go with 10 more pictures lol. Now take it very slow here you want to have a snug fit because this is what is holding the housing/lens. More importantly it’s holding the lens on good and tight. 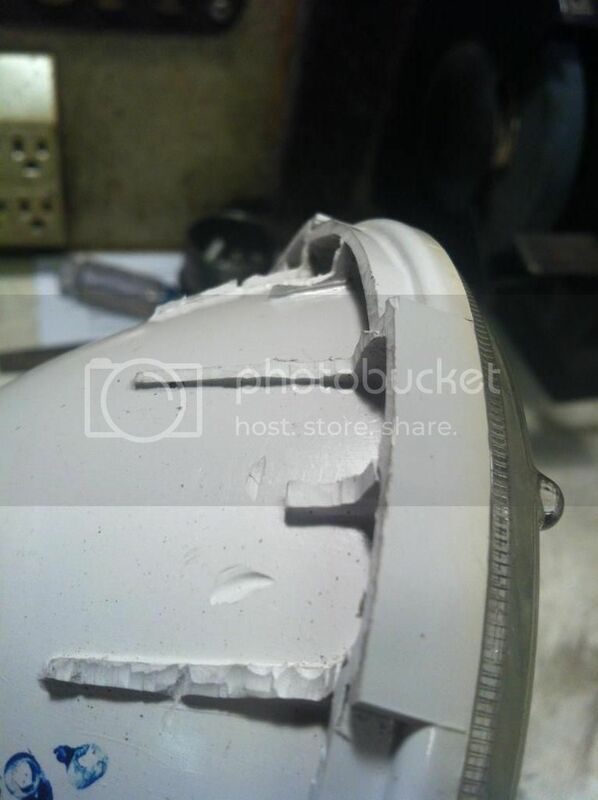 You don’t want the lip of the headlamp to sit flat on the lip of the bucket. You want about a 1/8” gap so the snug fit is important! Now in this picture it shows how the ring will be holding the lens to the now cut up bucket (which isn’t a bucket anymore). Remember SNUG FIT! You want it to be a little bit of a fight to slide it on. 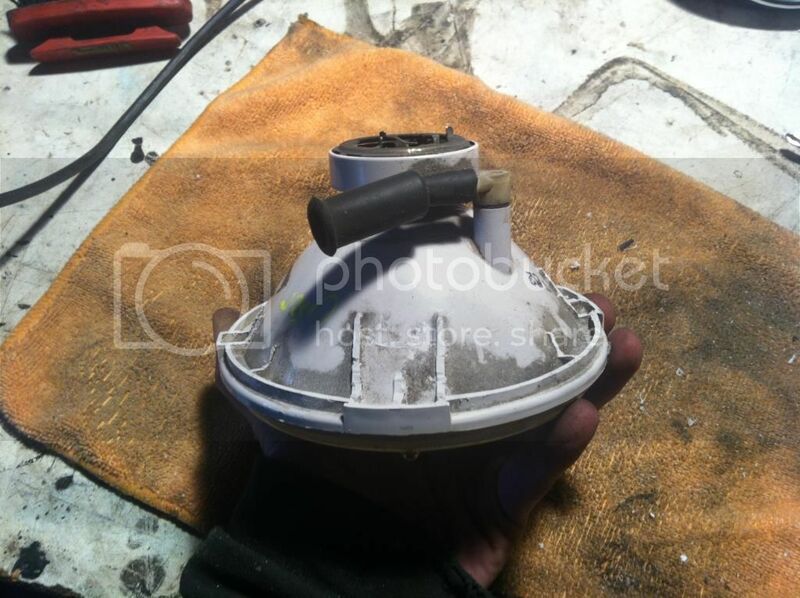 Remember to align the headlight to the bucket the breather tube is the top dead center of the headlight. Now as far as the radiator support this is where you need to be a little more careful. 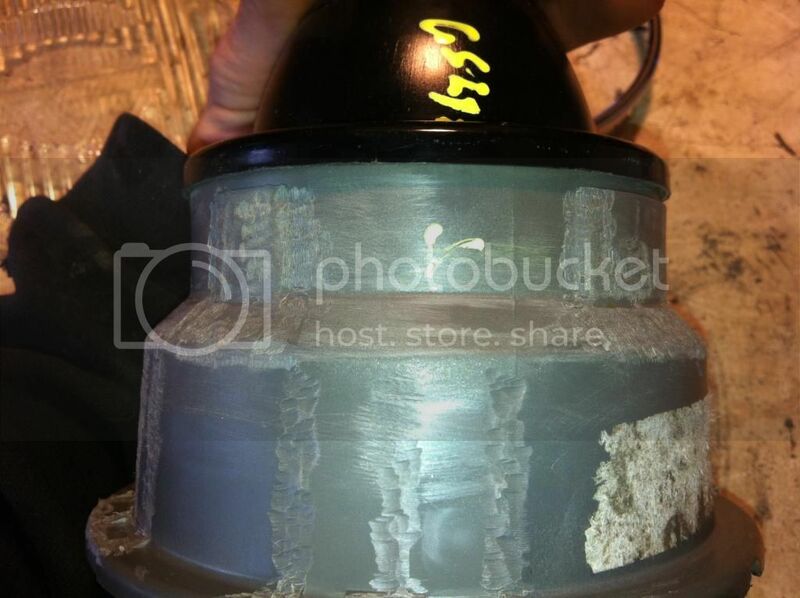 Take the bucket that you just cut put and place it on the radiator support where it would mount up. Take a sharpie and trace the inside of the bucket hole. 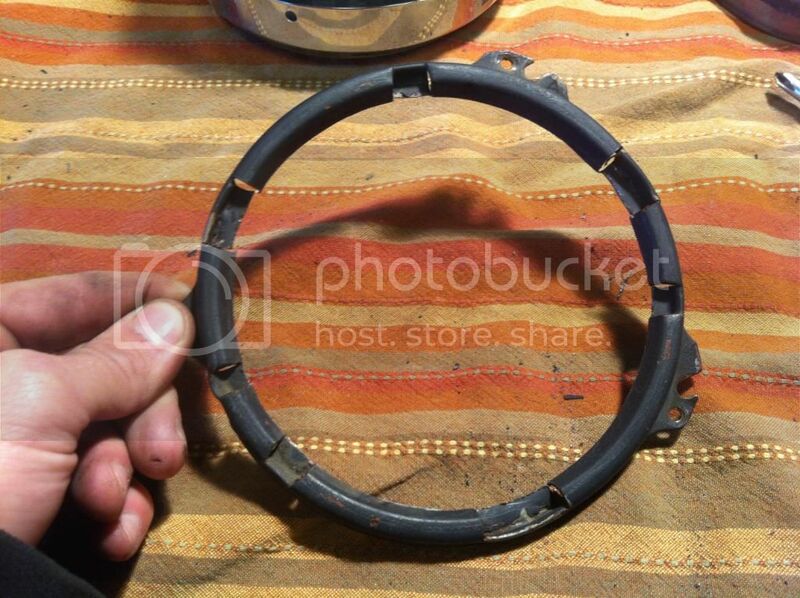 You want to cut inside the line a little so that the curve on the headlamp will ride on that hole. That way when you mount the headlamp it won’t just push all the way through nor will it come close to the adjusting points on the bucket. This will give you that ability to properly adjust the headlamp. Here is a back side view sorry for the poor quality. 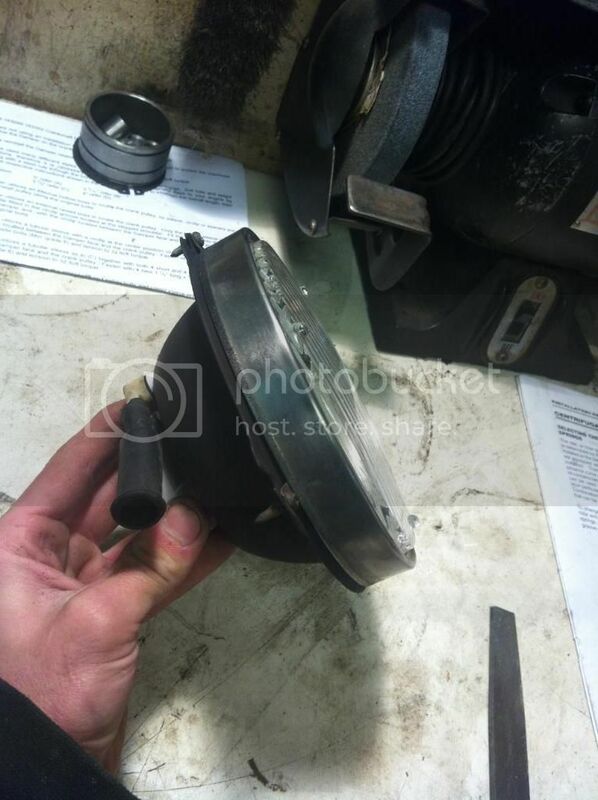 Now since you just cut the radiator support you in turn also cut the mounting point of the tension spring. 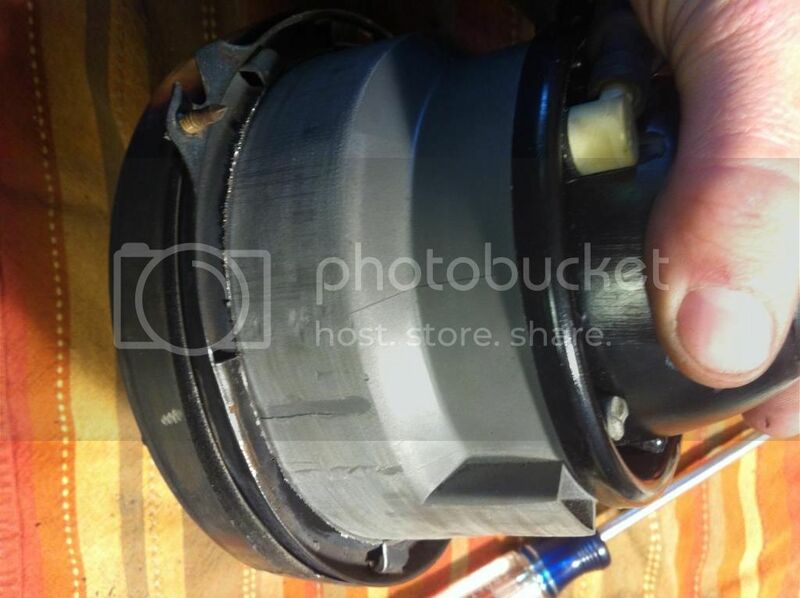 This is easily fixed by welding a small tab to the back side of the bucket in the same location the spring would be. Then drill a hole for a screw both in the tab then through the radiator support. This will act as a third adjustment point but more to secure the headlamp in place. Now adjusting the lows won’t be as easy as it was before, just take your time. It took me about 5 minutes to get mine where I wanted them. I removed the bezels to make it easier to adjust the lows and to show you what it all looks like. 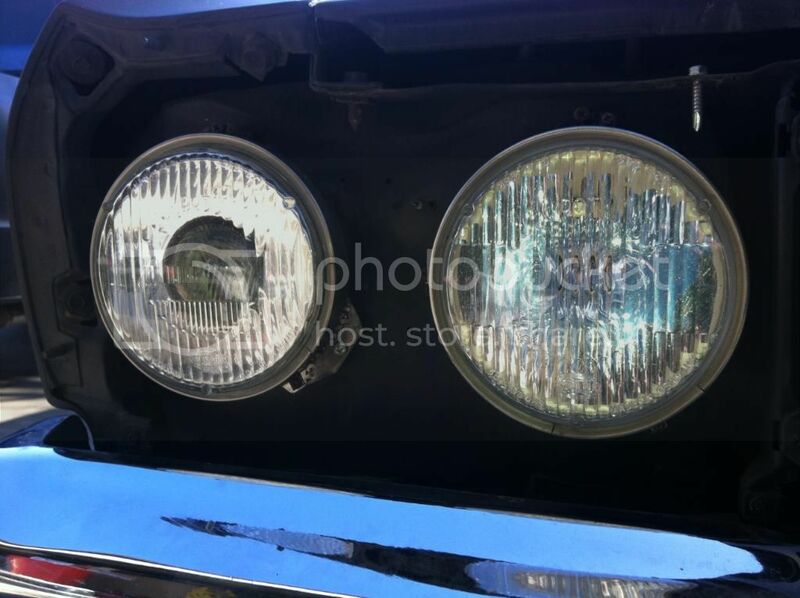 Ok so now here are just a few more pictures of the headlights. At this moment I do NOT have HID’s for my lows. I am using the cheap standard blubs for my lows and the brightest bulbs available for my highs. The one down side to doing this upgrade is the fact they take 9006 lows and 9005 highs. Now unless there is a way to wire them so that all four can be turned on at the same time its either the lows or the highs. Any help on wiring it so all four can run at the same time would be nice. BUT if you think about it and your running HID’s for lows you wont every really need your highs. Not unless you want the light to shine everywhere like a standard bulb. 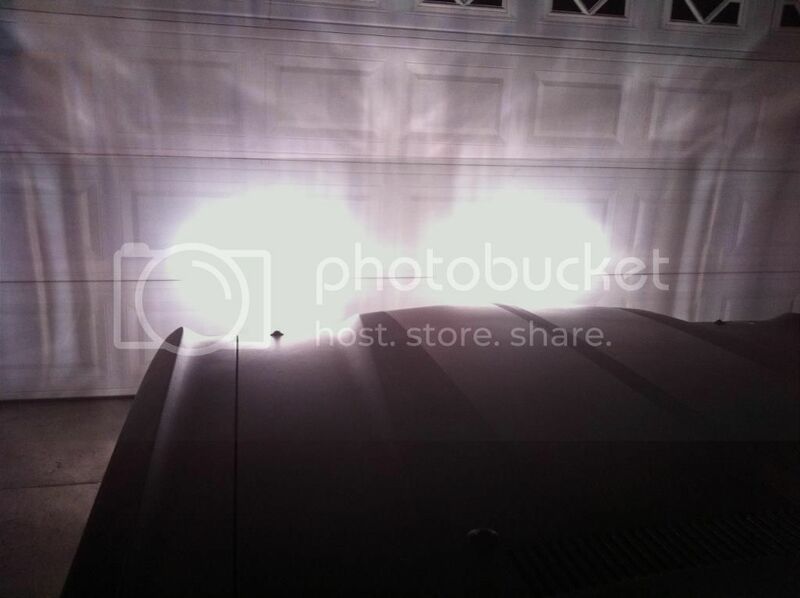 Now in the following pictures my El Camino is sitting in the driveway with the lights pointing against the garage door. Next time I go out driving I will get pictures of the light on the road. Very very nice write up!!!!!!!!! Thank you I did my best to explain and give as much detail as possible. This is an upgrade many of us here have wanted to know how to do so I decided to tackle it and share. I admire your work and ingenuity. Congratulations! However, those are not projectors. They're just a receptacle for an old style halogen light (with a pronounced cut off on the low beams), which was a big step up from US spec sealed beams of the day. They used to be outlawed on the grey market cars and had to be changed to meet DOT. 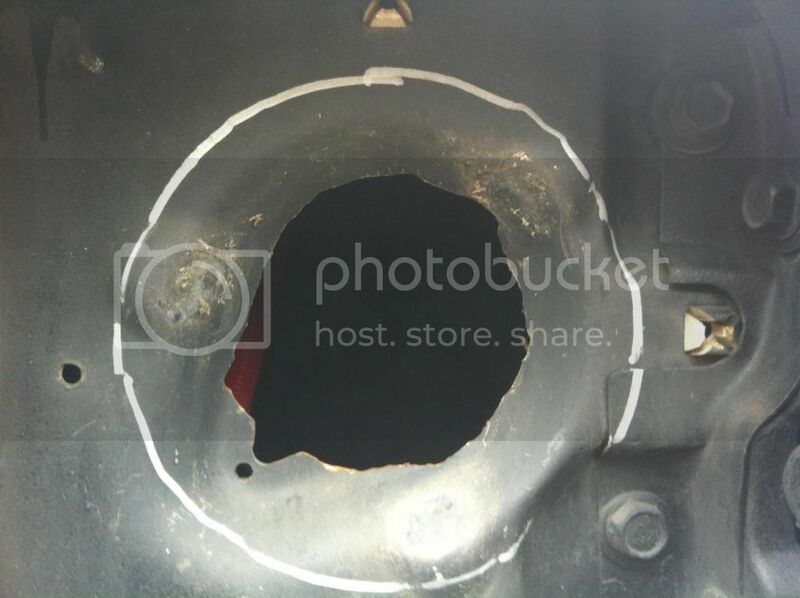 For comparison, here's a projector beam in a current housing. Yes, I know they are pricey and you are proud of your savings and should be. However you had to make some significant modifications to get them in there. Again, not trying to take anything away from you but offer an alternative to others who may desire the same result. 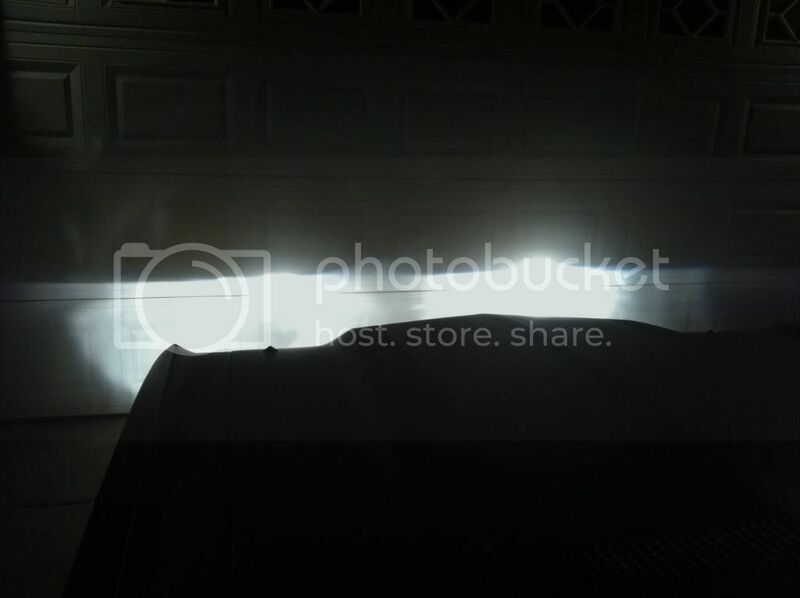 They are Acura projectors and make all the difference in the world but were not cheap. Thanks again for your well documented conversion. I think it was a 1994 BMW we had and I can tell you one thing....I've never drove a car with better lights! The high beams were amazing. Good idea and nice write-up. From what I was reading about these headlamps before I decided to buy them, was they are a halogen projector and not designed for HID's, tho HID's will work just fine. Can you help me and others understand the difference between projectors and receptacle headlamps? These came off of a 94 BMW . I'm very happy with the lighting. Even with the basic bulbs its much better lighting then when I had the clear glass with diamond cut background and 100w bulbs in them! Ryan, Is there a separate lense behind the outer lense or is that a reflective shield in the center? I can't tell by your pictures so I may be wrong. I was thinking you had the earlier beamer halogen housings. My apologies if so. So your highs are the hids and lows are halogen? The lows have a much better cutoff but the highs are pretty spread out. 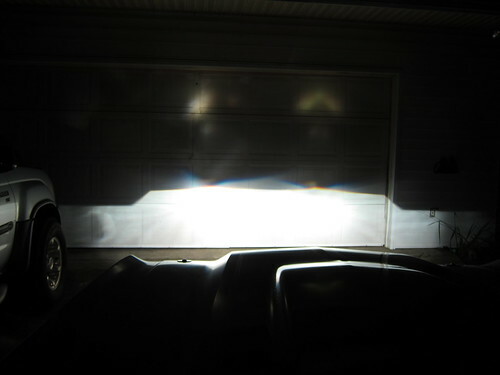 Here is a pic showing my hid highs in a projector, the cutoff is similar to your lows. Could you put projectors in the highs? Either way the lows look good for sure. Cool write up and I bet most of it would transfer to using projectors in all 4 spots. Several of the places selling expensive kits are just buying the same parts we could and charging a **** ton for labor. It's much cooler actually making something. 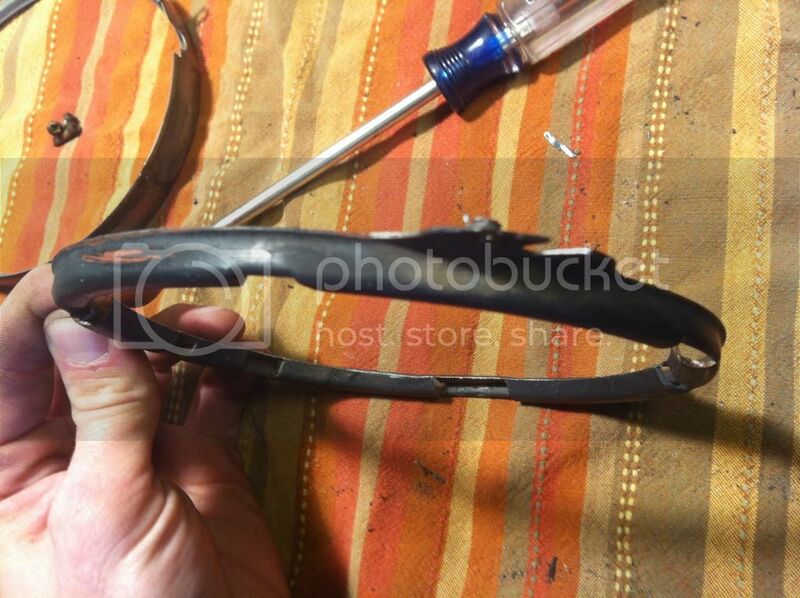 Some guy on stevesnovasite did basically what you did except he used projectors from an infiniti or acura and more or less stuck them on the back of the headlight buckets. Can't find the thread at the moment though. Yes there is a seperate lens behind the outer lense. For lack of better wording it looks like a magnifying fish bowl. Just like the projector you posted in the link. The lows are projectors with the highs being a standard composite headlamp. If I where to remove the outer lens the lighting would not change at all. That outer lense is acting more as a shelid. No... 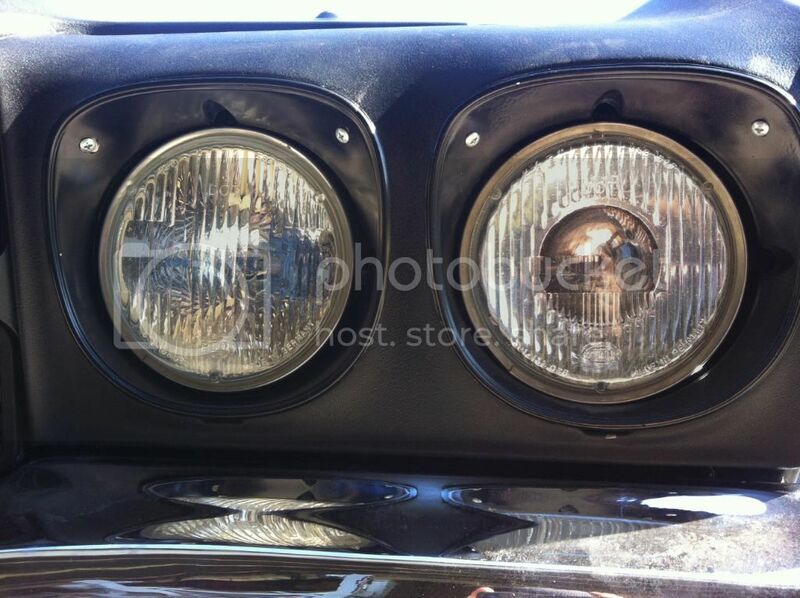 Right now and in those pictures I have halogens in all 4 headlamps. The lows are your cheapy bulbs and the highs are the new very bright Zxe bulbs. The lows are the only projectos with the cut off. My highs are standar composite headlamps. So it spreads the light just as a normal sealed beam only now with the composite headlamp I can use any 9005 bulbs I choose. Wicked sweet! Definitely unique. Congrats! I revise my remarks to say you can't get HID's with the Cibie's unless you have them modified. Are the Cibie's to shallow? The BMW lights I used are plenty deep for HID's. Once I get paid I will be buying a 55w slim digital AC ballast in 5000k (white) once I recieve them I will be posting a how to on installing and wiring them. Hey everyone sorry I haven't posted pics of the HID's yet I've been extremely busy lately... I started a new job and i work very odd hours. Ill get some pics up very soon guys. The amount of light output is incredible! I get ppl asking me how I had such night lights in a old car and when I say HID's they are confused at how I have them lol. This is one upgrade that's very much worth the time in modifications!!! Awesome thread, I've been thinking about this for a long time and after reading the entire thing this morning I went out and destroyed a BMW at lunch!